Hogjaw hail from the deserts of Arizona, and are no strangers to European shores. Last year they played 40 plus headline shows supporting the release of their new album, ‘Way Down Yonder’, recently released by Snakefarm Records. ‘WDW’ is album number six, and I’m sorry to say I’ve not heard of them before now. If you are like me, and not a hardened fan, but a complete newcomer, here’s a quick low down on Hogjaw. I spent all of my teenage years in the 1980’s, and listened (still do) to the main players at that time – Lynyrd Skynyrd, Blackfoot being a staple diet, alongside an entrée of Molly Hatchet and .38 Special. If any of these 4 bands make you all nostalgic for the 70s and 80s, then please, please look no further than these guys, as they epitomize all that is good and was great about American Southern rock. 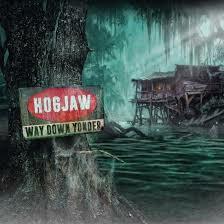 Hogjaw wear their music on their sleeve (literally) – its creepy swamp water and is as Southern as moonshine. In fact, I’m guessing its what they had in their bottles as babies. I have no point of reference with their previous output, just my 1980s upbringing. With opening song ‘Back Home Today’ one thing strikes me immediately, and that’s how good Jonboat Jones is (great forename, dude!). He reminds me of Darius Rucker of 90s band Hootie & The Blowfish. There’s also a running riff that very similar to Queen Of The Stoneage’s ‘No One Knows’. We’re off to a good start. There’s some song titles that could only come from a Southern Rock band – ‘Brown Water’, (I’m scared too to read the lyric sheet), ‘North Carolina Way’, ‘Talk About Fishin’’ and the un-mistakeable ‘Got A Pencil’. ‘To Hell With The Rest’ melds Skynyrd with ZZ Top with some pretty decent guitar playing, and Jones’ melody shining through. “Brown Water’ thankfully isn’t a song about the shits, its whisky, thankfully. It’s a faster paced rocker with plenty of energy. ‘North Carolina Way’ is 100% proof pure Lynyrd Skynyrd, with JJ sounding a lot like Van Zandt, with its relaxed verse, before unleashing a powerful chorus. Title track, ‘Way Down Yonder’’s’ riff, is almost a toned back version of Rainbows Sixteenth Century Greensleeves (more to follow…). It has smokin’ and smoulderin’ guitar work, coupled with decent harmonies, and even some a capella with added handclaps for added effect. Its the best song on WDY by a country mile – its their Stargazer (Hint. Or is it?). ‘Dark Horse’ is a slow down, a chance to take stock and catch your breath, with its darker lyrical content. ‘I take back (almost) what I said about the title track, ‘Redemption’ is the best track on the album. It’s a sprawling, moody beast of a number. Like any good song its based around a great guitar sound, harmonies, and an anthemic like chorus. Played live, this will probably be a 15 minute opus! ‘Got A Pencil’ goes back to its Southern roots, slide guitar, machine gun drumming (like Brian Downey), and when combined, takes the song up a level or two. ‘Never Surrender’ has its riff come right out of the blocks at ya. It has more of a spoken word vocal for the verse, and shows that Hogjaw do not follow trends and do things their own way. Tracks 1-9 are pretty much southern rock staples, until track ten. ‘Beast Of Burden (Roll On)’ made me do a double take at my computer as I thought I’d skipped a track or two. The riff for this almost note for note ‘Stargazer’ with new lyrics, make no bones about it. You could call it plagiarism, I prefer to call it a tribute to obviously one of their favourite bands. If they love it as much as I do, then good on ya. Try and get past the riff and it’s a good enough song. Finally its onto the last track ‘Talk About Fishin’’ which is bluegrass/country and like Star-Burden is far removed from the rest of the songs. Despite know having a Scooby Doo about Hogjaw, it’s been a very pleasant surprise in hearing them six albums in. That said, I’ll be checking out my digital supplier of streamed music to check out their back catalogue, and if you’re a fan of any of the bands I discussed at the top of this review, then you should to.